Location and Arrangement of Transportation Facilities. Also, we explained the first principle; Efficiency of Interior Circulation in above article and explained the human factors in article “Vertical Transportation Design and Traffic Calculations – Part Three”. And we explained the first four items in article “Vertical Transportation Design and Traffic Calculations – Part Four”. Today we will continue explaining other Principles of Interior Building Circulation. The running speed is determined by the angle of inclination. The speed as in the escalators is measured in the direction of movement of the steps or pallets, ie: along the horizontal. Easily allows two stationary files of passengers or the possibility a stationary file and a walking file of passengers on the moving passenger conveyor. inclinations in the range 3° to 12° although the maximum is generally 10° and the practical is 8°. A passenger conveyor theoretically should permit denser congregations of passengers than an escalator, as the space is not rigidly defined by steps. In practice, the probable density will be about 2.0 Person/m2. W is the effective corridor width (m). Table-1 indicates practical handling capacities in persons per minute and persons per hour (bracketed) assuming a density of 2.0 persons/m2, using Equation (1.1). This implies that when riding in a 6-person car, each passenger can occupy 0.22 m2, but when in a 33-person car the same passenger is only allocated 0.15 m2 of space. These values in above table require passengers to be very crowded in a large car. 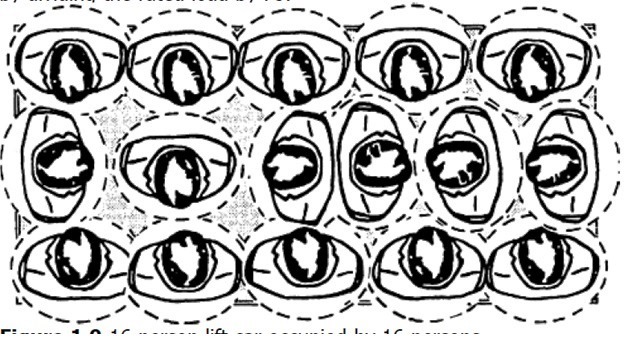 Fig.1 illustrates the density pattern for a lift with a rated capacity of 16 persons (rated load 1275 kg) with 16 persons present. It can be seen that the lift is not able accommodate this number of passengers, as the platform area is 2.9 m2, which would allow some 14 persons to be accommodated. Even with 14 persons present, the passengers would be in the intimate zone as shown in Table-2. Body sounds, smell, heat all perceivable; sight distorted; very difficult to avoid contact. Method#2: from Table-3 which give the smaller value. Beyond 20 passengers add 0,115 m2 for each extra passenger. It is recommended that a uniform figure of 0.2 m2 for each passenger be assumed (almost 5 persons/m2) when sizing a lift car in order to carry out a traffic design. The average number of passengers carried per trip is an assumed value. Industry practice assumes a car loading of 80% of rated capacity. Values less than 80% do not fully utilize the installation, and values above 80% quickly result in poor service times. INT is the interval between lift arrivals at the main floor (s). Table-4 indicates that the actual car capacity figures are smaller than the rated car capacity suggested by dividing the rated load by 75. Rated load (RL) values, in kg, taken from ISO 4190–1. Maximum area values, in m2, taken from EN81, Table 1.1. Rated Car Capacity (CC) calculated by dividing the value for RL by 75 as EN81, Clause 8.2.3. Actual Car Capacity (AC) calculated by dividing the value for maximum car platform area (CA) by 0.21. Design Car Capacity (DC) calculated as 80% of actual car capacity (AC). Capacity factor (CF), in per cent, calculated by dividing Actual Car Capacity (AC) by Rated Car Capacity (CC). Actual load (AL), in kg, calculated by multiplying Actual Car Capacity (AC) by 75. The walking time (and walking effort) for stairs and escalators. Stairs or escalators are used for travel over a small number of floors. The use of escalators is mainly inhibited by the length of time travelling. Mid and High rise buildings such as big office buildings. Low rise buildings, such as shopping centers, sports complexes, conference and exhibition centers, railway stations, airports, hospitals, etc. Table-5 provides guidance on stair usage as per floors travelled. Table-6 offers some guidance to the division of passengers between lifts and escalators in offices as per floors travelled. The provision of well positioned stairs and escalators can considerably lessen the demands made on the lifts. Designers must take these factors into account. All elements are assumed to be operating at their full flow design density levels, which is the optimal flow level. The values given are rounded for convenience, and apply to average groups of people and facilities. Table-7 indicates the Comparison of handling capacities in persons/minute of the various building elements in persons/minute. * Passengers constrained by car walls. The distribution of the occupants in the building. It may be better for occupants to walk to the center of a building to access stairs and lifts, since their usage during the day may outweigh the comparative inconvenience during arrival and departure. Generally the maximum distance to a lift or stair from an occupant’s work place should not exceed 60m with a distance of less than 45 m being preferred. Emergency escape routes are usually closer, but do not necessarily form part of the normally used circulatory routes. There are several standard escalator arrangements, as shown in Fig.2. Walk Round arrangement: this arrangement is typical of a shop as it allows the shop to deliberately lengthen the circulation route to pass goods for sale. This configuration also takes up less space. Where possible, stairs and escalators should not lead directly off corridors, but should be accessed from landing and lobby areas, where people may wait without obstructing a circulation route. Thus the vertical and horizontal modes of circulation can be allowed to merge smoothly. If it is the intention to encourage the use of stairs for short journeys to/from adjacent floors (inter-floor movement), then the stairs should be clearly visible, adequately signed and reached before entering the lift lobby. The location of escalators should observe the same recommendations as those for the location of stairways. However, it should be noted that escalators occupy a larger footprint than stairs in order to accommodate their inclination, structure and equipment spaces. It is particularly important that the boarding and alighting areas adjacent to an escalator are not part of another circulation route. This will provide a safe area for passengers to board and alight. Escalators are typically used for short range movement between adjacent floors (the deep underground railway systems excepted). They are found in offices between principal levels, in shops between trading floors, in shopping centers between malls and elsewhere, such as railway stations, hospitals, museums, etc. They are usually sited in an obvious circulation path making it easy for pedestrians to board them. 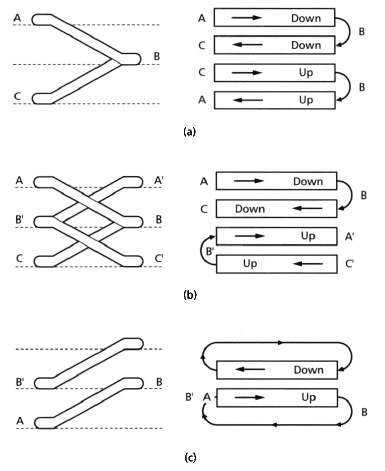 The preferred arrangements from BS-5655: Part 6 of (2) to (4) lifts arranged side by side are given in Fig.3 and for (2) to (8) lifts arranged opposite each other are shown in Fig.4. Note all the lobbies, indicated (L), have separate waiting areas with no through circulation. Lifts should always be placed together whenever possible, rather than distributed around a building. This arrangement will help to provide a better service (shorter intervals), mitigate the failure of one car (availability of an adjacent car or cars) and lead to improved traffic control (group systems). Lift lobbies should preferably not be part of a through circulation route, either to other lifts, or other areas in the building. Lobbies should be provided that are dedicated to passengers waiting for the lifts. Eight lifts are the maximum number which it is considered possible to present to waiting passengers, especially if the lifts are large (<26 person). This constraint allows passengers to ascertain the arrival of a lift easily (from the landing lantern and gong signals), walk across the lobby and enter the lift before the doors start to close. The ideal lobby size would be one which could accommodate one full car load of passengers waiting and permit the simultaneous disembarkation of one full car load of arriving passengers. Suppose there are four 21 person lifts arranged in a facing (2×2) configuration. What distance across the lobby would be appropriate given the car width is 2100 mm and the car depth is 1600 mm? The cars occupy a 6.0 m length of lobby (along the front of the cars). Case#1: Assume that a 21 person car can accommodate 21 persons. When one of the cars in the group of four arrives, it will disembark 21 persons. Thus for these passengers to be accommodated at the dense level of occupancy of 2.0 persons/m2 in the lobby, an area of 10.5 m2 = 21 /2 would be required. If it is assumed that there are 21 persons waiting to board, then they will require a further area of 10.5 m2. Hence a total of 21 m2 is required. As the lobby length is 6.0 m, then a width of 3.5 m is indicated, which is slightly larger than the ISO recommendation of the sum of the depths of two facing cars, ie: 3.2 m.
Thus for these passengers to be accommodated at the dense level of occupancy of 2.0 persons/m2 in the lobby, an area of 8.5 m2 = 17 /2 would be required. If it is assumed that there are 17 persons waiting to board, then they will require a further area of 8.5 m2. Hence a total of 19 m2 is required. As the lobby length is 6.0 m, then a width of 3.2 m would probably be sufficient which is equal to the ISO recommendation of the sum of the depths of two facing cars, ie: 3.2 m.
In the next article, we will start explaining the Traffic Design Calculations. Please, keep following.